Structural Reflexology® is the practice of integrating foot reflexology with anatomy, physiology, and kinesiology by using local and reflexive methods to release stress and compensation in the entire body. 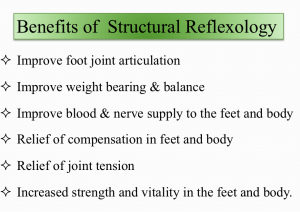 Structural Reflexology addresses tension sites on the feet as the product of local muscle and ligament strain while maintaining an understanding of how these sites of tension on the feet will impact the rest of the body. Who can benefit from receiving Structural Reflexology®? Everyone can benefit. Feet bear the entire weight of the body and most times this weight is carried under strain. Feet are designed to support and move the body and they gain strength the more they are relied on. It may behoove some to hear but they are completely equipped for this job, in fact, feet enjoy bearing weight as long as their functional integrity is in tact. Once the joint structures of the foot have been challenged the feet will be unable to cope with the demands of transferring weight and eventually signs of this breakdown will be indicated as pain in certain parts of the foot and body. Structural Reflexologists are able to assess foot mechanics, identify tension sites that inhibit foot mobility, and use specific techniques to release areas of muscle and ligament strain in the foot and lower leg. These techniques help to restore comfort and function which allows the bones of the foot to find their normal alignment. Once the foot muscles are able to maneuver the foot more easily and recover the job of moving and balancing the body, compensation in the rest of the body is relieved. #Structural Reflexology® Map What is Structural Reflexology®? 4 Responses to What is Structural Reflexology®? I would like to purchase your structural map. 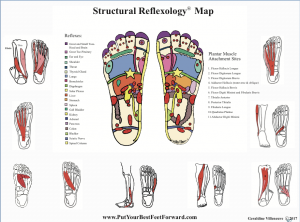 Please check your email for instructions to purchase my Structural Reflexology map. The closest Structural Reflexology trained therapists are in Washington State. Contact me at structuralreflexology@gmail.com if you would like their contact info.